The Trauma & Resilience special interest group provides a collaborative learning environment to understand the meaning of trauma and resilience and investigating resiliency – who is resilient and why? How can resilience be fostered in the wake of trauma? What can faculty learn from highly resilient individuals that will help inform their work with students? 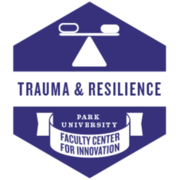 This badge acknowledges participation in a faculty learning community focused on exploring the impact trauma and resilience has on student learning. Recipient participated synchronously or asynchronously in a Faculty Center for Innovation-sponsored learning community on the topic of Trauma & Resilience and has produced a written reflection on how the knowledge gained has affected his/her teaching, scholarship, or service.